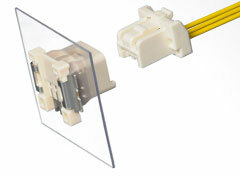 Waldom Electronics supports all Molex New Product Introductions (NPI) through Waldom's NPI Launch program. Our NPI Launch program allows Molex authorized distributors to purchase new products in less than factory MOQ for immediate shipment, helping Molex and its authorized partners speed delivery of product to end users with minimal risk of excess inventory in the channel. Delivering high density and excellent frequency performance, SMPM RF Blind-Mate connectors reduce system weight in comparison to larger connectors and increase manufacturability with the use of multiport connectors. 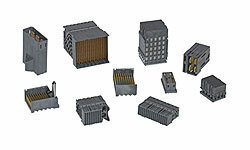 Delivering industry-leading signal integrity and density while providing a scalable price and performance path for future data-rate enhancements, the Impel™ system of backplane connectors and customized cable assemblies offers OEMs the option for equipment to operate at today’s data rates and costs. Miniature and mechanically resilient compression connectors provide excellent electrical contact for reliable operations in ultra-slim mobile devices. Available in both 1.00 and 1.50mm pitch versions, the Pico-Lock™ wire-to-board system offers an ideal combination of low profile, high current and durable locking for any application requiring space savings and secure mating retention. Eliminating the need for mating headers, EdgeMate™ power connectors offer positive PCB-locking and significant cost savings for wire-to-edge-card terminations in appliance, industrial and lighting applications. Ideal for tight-packaging applications in all industries, the Micro-Lock 1.25mm pitch system offers the smallest overall size and highest current-carrying capability of any similar pitch positive-lock system. Ideal for tight packaging constraints, low-profile SolderRight™ Direct-Solder Terminals enable right-angle connections to a PCB at a low applied cost. Vertical SMT Modular Jacks with Kapton tape for vacuum pick-and-place functionality can streamline high-volume PCB production and lower manufacturing costs. The ultimate high-density memory interconnect for multi-processor server chipsets, Aerodynamic DDR3 DIMM sockets maximize air flow as well as space and cost savings, with low power consumption. CLIK-Mate™ 1.5 wire-to-board system offers a wide variety of mechanical and electrical options along with robust features and a positive lock to meet both signal and power needs. Compact 28-circuit high-current header mates with Molex's 28-circuit female power connector to offer customers a complete space-saving, wire-to-board solution for sealed transportation applications requiring up to 21Amps. Meeting JEDEC specifications, these high-speed DDR4 DIMM sockets offer greater PCB real-estate and cost savings with excellent assembly-processing compatibility. Low-profile EdgeLine® connectors support up to 25 Gbps data rates and are available in multiple orientations and PCB thicknesses for use in high-signal transmissions and high-density signal applications. Delivering 60.0A via split-blade technology, Molex´s innovative EXTreme OrthoPower™ Orthogonal Direct-Power Connector System solves the networking and telecommunications challenge of routing power to backplane line cards. FAKRA II SMB connectors, with 360° rotation and secondary locking latch deliver easy cable routing between antennas and multi-media units while meeting the USCAR requirements for on-board telematics systems’. Molex's Slim Type FFC/FPC connectors offer the lowest-profile and narrowest width of any similar version in the market for applications such as thin LED TVs. Designed to meet the backlighting needs of LED TVs and room lighting applications, Molex’s new Flexi-Mate™ family of connectors is the first of its kind on the market to provide a full range of both board-to-board and wire-to-board solutions. Molex’s 0.20mm pitch FPC connector offers optimum space savings in height, width and length for mobile and other tight-packaging applications. The 0.30mm pitch non-ZIF FPC connector offers a compact size along with secure cable retention and low cable insertion force. Pushing the density envelope to meet next generation high-speed demands, the Impact™ Backplane Connector System features superior electrical performance up to and beyond 25 Gbps with one of the most versatile offerings in the market. Designed for large-scale data-center storage systems, industry-leading iPass+ HD Interconnects support SAS 3.0 signaling up to 100m with low power consumption, while reducing cable-management challenges. Ideal for use in industries such as automotive, medical and consumer, KK® 254 Reflow Process Compatible (RPC) Connector System supports a lead-free solder process and delivers up to 4.0A and 250V per circuit in a 2.54mm pitch package. Tape-and-reel packaging with pick-and-place caps available. Delivering 13.0A and 600V per circuit, the KK® 396 Reflow Process Compatible (RPC) Connector System suports a lead-free solder process and is ideal for low- to mid-power wire-to-board and board-to-board applications. Tape-and-reel packaging with pick-and-place caps available. Ideal for OEM light-fixture manufacturers, Molex LED Array Holders simplify the light-fixture installation and achieve industry-leading thermal, electrical and optic performance for next generation COB arrays by eliminating hand soldering. Simplify light-fixture installations and achieve industryleading thermal, electric and optic performance with reliable, solderless LED Array Holders (Series: 180810, 180720,180560). Ideal for thin LED lighting-module applications, Molex´s Lite-Trap™ SMT wire-to-board connectors offer a low profile, easy wire removal, and low wire insertion and high wire retention forces. PDJack™ with integrated Power Device controller circuitry plus Ethernet connectivity simplifies PoE Plus implementation for any network device, reducing time-to-market, lowering costs and achieving considerable PCB space savings. Power over Ethernet Plus 12-port (2x6) and 8 port (2x4) RJ45 magnetic jacks supporting Gigabit Ethernet connectivity in accordance with IEEE802.3ab deliver up to 30W of power to networked devices. USCAR Mini50™ approved interface delivers 50% space savings over traditional USCAR 0.64mm connectors in interior, unsealed, transportation-vehicle environments. The high-performance, compact MXP120™ Sealed Connection System is designed to perform in harsh environments and can replace common 1.50mm systems in space-constrained in-line harness applications. Cost-effective and compact, the easy-to-assemble NSCC connector system carries power for a range of unsealed body-electronics applications in automotive and commercial vehicles. Delivering streamlined behind-panel routings with MT, MPO/MTP* interfaces and IP67-sealed harsh-environmental protection with LC interfaces, Optical Electro Magnetic Interference (EMI) Shielding Adapters are ideal in networking and industrial applications. The Pico-Lock™ 1.50mm pitch wire-to-board system offers an ideal combination of low profile, high current capacity and durable locks for any application requiring space savings and secure mating retention. 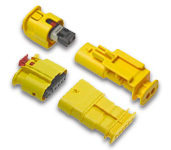 The block-style SIM Connector ensures high connector reliability by providing stable, low contact resistance over the operating life in all applications. Leading the consumer electronics and automotive industries with the largest number of variations and cabling configurations, SL™ Modular Connectors and Assemblies are ideal for low-power and signal wire-to-board and wire-to-wire applications. Ideal for the thinnest mobile devices, the SlimStack™ ST7 0.35mm pitch board-to-board connector system offers the most space savings of any similar pitch system along with robust features that provide secure mating retention, terminal protection and reliable electrical contact. Molex's SpeedStack™ Mezzanine Connector System delivers a high-density, low-profile solution with data rates up to 40 Gbps per differential pair, ideal for OEMs of networking, telecom and medical equipment with space constraints. New generation 84-way Sealed Rectangular Connectors, with single-handed blind mate functionality, use proven MX150™ and MX150L™ terminals to offer a hybrid, high power-and-signal circuit-count system for harsh applications in commercial vehicles. Stackable connection system provides single and multi-pocket PCB solutions, offering a diverse range of circuit sizes and greatly reducing time-to-market by completely eliminating custom tooling; female connectors feature only pressure-activated design in the industry. RF/Microwave cable assemblies, with a range of connectors, are available from Molex, using our Temp-Flex low loss and ultra low loss cables with outer jacket diameters of .056",.101" and .158". Meeting USB 3.0 high durability class standards, SuperSpeed connectors provide reliable connectivity while supporting high temperature, IR-reflow processes for computer, consumer and car product applications. Achieve superior signal integrity in harsh factory and commercial-vehicle applications with IP67 Sealed Industrial USB 3.0 Panel-Mount Receptacles, designed for fast installation and robust pull-out resistance. Reduce disruptive EMI and RFI with Woodhead® MAX-LOC® Plus Shielded Cord-Grip Assemblies, featuring a simplified installation design ideal for high-frequency switched-mode power supply (SMPS) applications. Enabling ground-fault protection to be installed wherever personnel and equipment are at risk, Super-Safeway™ and Safeway® products offer a broad-line of permanent–mount and portable GFCI solutions for commercial and industrial applications. Supporting next-generation 100 Gbps Ethernet and 100 Gbps InfiniBand* Enhanced Data Rate (EDR) applications, Molex´s zQSFP+ Interconnect Solution transmits up to 25 Gbps per-serial-lane data rates with excellent signal integrity (SI), electro magnetic interference (EMI) protection and thermal cooling. Molex launches the first complete zSFP+ Interconnect System for 25 Gbps serial channels, delivering unparalleled signal integrity with superior EMI protection for next-generation Ethernet and Fibre Channel applications.